Today is the first day of World Space Week, an international celebration of spaceflight’s contribution to enriching and improving the quality of life for the human race. Officially recognized by the United Nations, it begins every October 4th (the day that Sputnik launched) and runs through (the day that the Outer Space Treaty was signed). Here at Take Back the Sky, we’ll be celebrating with a special post each day, with a few surprises at the end! As we talk to people all over this little world, we continue to find that many people simply aren’t aware of what’s going on in the world of spaceflight — many aren’t even aware that the space shuttle is no longer flying, nor will ever again fly. On the one hand, if a majority of people cared enough about space to “educate themselves” about it the way that they do about other issues, like the economy or the environment, then things would be vastly different today and we might not even be having this conversation. To be fair, the topic of humans in space hasn’t seen the front page of any major media outlet in many years. The beginning of the end of the space shuttle program actually occurred back in 2004, as NASA slowly started phasing out elements of it. Early that same year, it was first announced that the agency was pursuing a new plan, called the Vision for Space Exploration. It called for the completion of the International space station by 2010 (check – a year overdue, but better late than never), the retirement of the Space Shuttle immediately after (check), and to return to the moon by 2020. 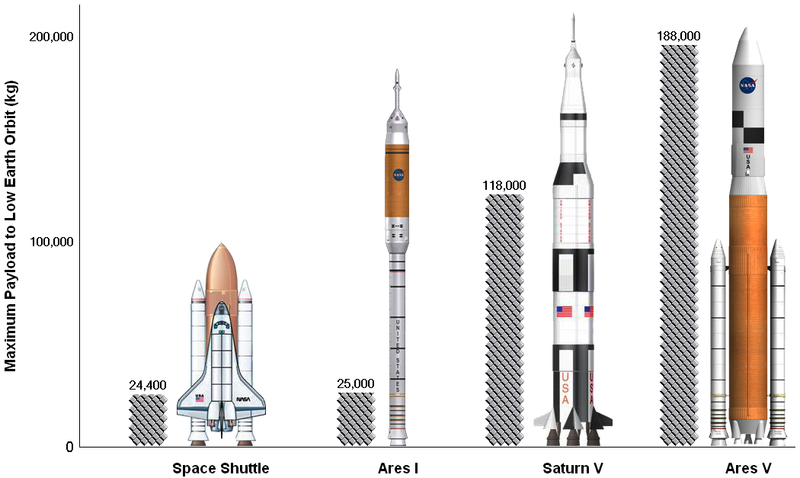 To accomplish the latter goal, the VSE proposed the development and construction of not one, but an entire family of rockets and craft, called the Constellation Program. In this new initiative, different boosters and space vehicles would be assembled into custom configurations for each mission. Going to the ISS? Start off with your basic package of a capsule on top of an economy rocket. Heading back to the moon? Upgrade to a heavy-lift model with an additional “departure stage” and new model of lunar lander. Building a base on Mars? Take two trips: One jumbo rocket to act as moving van, the other as a mobile home or trailer (more on that in another post). The centerpiece of this bold, new plan was a return to capsule spacecraft like the Apollo ship that took American astronauts to the moon and back, named Orion. The rockets themselves would be built from parts from the Space Shuttle — namely, the main engine, the white solid-fueled boosters, and the large, orange liquid fuel tank — and thus, had a somewhat familiar look to them. This line of “heavy-lift vehicles,” called Ares, and the Orion capsule, however, lay at the center of a heated controversy within NASA itself. Many engineers and technicians were skeptical of the design and analyses conducted on it, and felt that they were unsafe for astronauts to trust their lives to — SO MUCH SO, in fact, that, when they couldn’t find a sympathetic ear, they met in secret on weekends and late into the evenings designing their own rocket systems, called DIRECT. It certainly wins the door prize. Regardless of whether or not their concerns weren’t unfounded, this was an accomplishment that cannot be overstated — the ultimate open source project. Whereas it took several years and billions of dollars to design and do the math for every single square inch and to make sure that every single part worked in absolute perfect harmony for the Saturn V rocket that took us to the moon, here was a group of passionate individuals who believed in what they were doing so much that they did it all during their free time for free. In the end, though, none of it mattered. The debate was ultimately laid to rest when the NASA Authorization Act of 2010 was passed, which included the cancellation of the Constellation program. All development of the Ares rockets (and any chance of building team DIRECT’s alternative, the Jupiter rockets) were immediately halted. 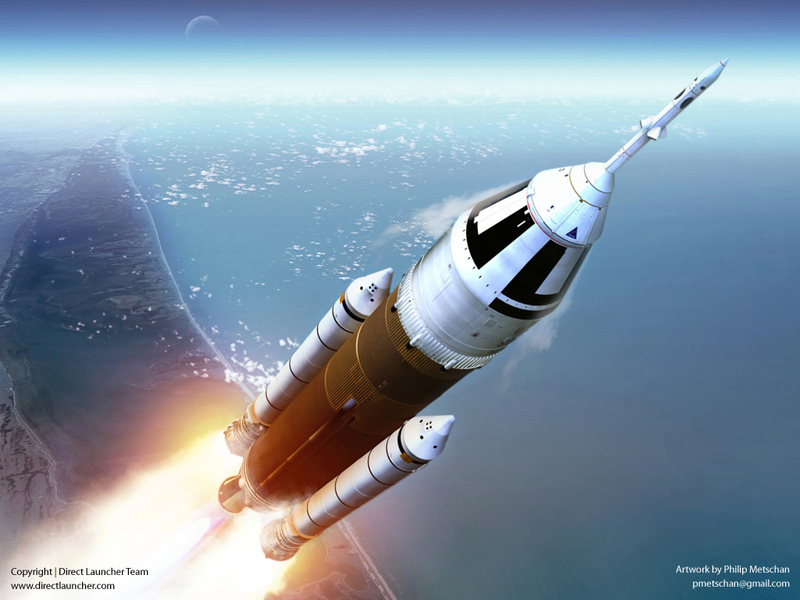 While testing and development of the Orion capsule would ultimately continue under Lockheed-Martin, and “design studies” would commence on yet another rocket, the Space Launch System, the latter would be in name only. Hurricane Layoff had struck the Space Coast at long last. The silver lining in the Authorization Act was the extension of the ISS’s lifespan by five years and a newfound focus on contracting out the “chores” of flights to Low Earth Orbit (LEO, where the shuttle flew, satellites orbit, and the ISS is located). It called for the creation of the Commercial Orbital Transportation Services (COTS) program in 2006 that would offer financial, milestone-based incentives for private companies to develop the capabilities that would return American astronauts to space. Many competitors vied for the privilege in a series of judging rounds where they were eliminated, like a reality TV show. At the end, two remained: SpaceX and Orbital Sciences. SpaceX succeeded in performing two test flights of their Dragon capsule aboard their Falcon rocket. COTS-1 and COTS-2 were flown in orbit and to dock with the ISS, respectively. Orbital Sciences will attempt to catch up in December 2012 with the first flight of its Cygnus craft. The Sierra Nevada Corporation of Colorado has been proposing its Dream Chaser spaceplane concept for several years. It would fly atop an Atlas V rocket, which, while it already exists and is available, would require extensive and costly modifications to make it safe for carrying crew (which is was never designed to). Boeing is throwing in with their concept for a no-nonsense capsule of their own with a traditional space program name of CST-100. While it would be compatible with several different rockets made by different manufacturers, they’re shooting for the Atlas V, as well — it’s their rocket, after all. The final contender and front runner is one that, hopefully, you’re already acquainted with: Space Exploration Technologies. Out of all these various companies and hypothetical ships we’ve covered here, the Dragon capsule is the only one that actually exists in a flyable state and has flown. Confused? Lost? Wondering what the big deal is if NASA contracts out a space taxi? Take a look at the big picture, and try to see this as “one small step” into a much larger ‘Verse. The general idea behind all this is that, by letting the private sector take over the routine flights into space for cheaper than what was spent on the shuttle, NASA saves money and is able to focus its efforts on what it does best: unlocking and exploring new frontiers. It also paves the way for new, mutually beneficial partnerships. One example that is being discussed a lot is having private companies place and supply orbital fuel depots. It’s an inexpensive cargo (as opposed to a billion-dollar satellite that can’t be replace) and an easy job to hand off to them, and it’d allow NASA to, say, go to the Moon or Mars while only having to carry half as much fuel with them. It isn’t about “corporations taking over the space program,” it’s about both public and private sectors working together in a true synergy that will expand what each are able to do. Right now, we’re on the eve of the single most important event in the history of that partnership, the first flight of a private, crewed spacecraft. This ship is the first step towards a future where all private individuals own a ship of their own — not just the wealthy tourists, but ordinary people like you and I — and can go wherever they please in the cosmos. That first flight is a step that will result in our grandchildren (or however far down the line of our descendants) enjoying a freedom that pioneers, pilgrims, or founding fathers could never have dreamed. That first step into the black is important to us here at Take Back the Sky, and we feel it only fitting that it be named after another private ship crewed by men and women who sought freedom and peace as only space can offer: Serenity. We hope that you have found this quick primer helpful in bringing you up to speed on the state of spaceflight. We’ll be introducing some of the other big players you should know about in order to understand what’s going on when you do hear news about space (we promise they’ll be shorter than this blog entry). In the meantime, why not start off World Space Week by writing Elon Musk?